On 4 December, Italians will vote in a referendum on the most far-reaching constitutional reform since the birth of the Italian Republic. From the very beginning, the country’s Prime Minister, Matteo Renzi, has linked the fate of his government to approval of the reform, promising to resign should the proposal be rejected. In doing so, he has shifted the meaning of the referendum away from simply constitutional reform, and toward a verdict on his personality instead. Although this ‘personalisation’ strategy seemed effective when Renzi’s approval rate was high, now that voters’ support for the government is declining, this strategy may ultimately backfire. We have carried out new survey research which adds evidence to this perspective. The key finding from our research is striking: that merely mentioning the constitutional reform has been proposed by the government reduces its support among Italian voters. A few weeks ago, together with Professor Hanspeter Kriesi of the European University Institute, we launched a study with the aim of understanding how Italian voters are making up their minds on such a salient, but also technical and complex issue. From 5 to 10 October, we launched the first wave of a panel survey with a representative sample of Italian voters with internet access (N=2,279). Three weeks later, between 27 October and 3 November, we contacted the same respondents again and randomly asked each participant to read different information and answer different sets of questions. Some respondents were asked to read either an argument in favour or an argument against the reform. These arguments were taken from the public debate on the referendum and concerned key elements of the reform such as the fact that the reform should make the legislative process more efficient. Other respondents did not read any arguments, but only a simple ‘government cue’: a sentence stating that “the reform was proposed by and represents one of the key points of Matteo Renzi’s government”. Figure 1 presents the effect of these elements on support for the constitutional reform, as measured on a scale from 0 (extremely opposed) to 10 (extremely in favour). The dashed horizontal line corresponds to the control group, in which people neither read an argument nor received a cue. Vertical bars correspond to 90% confidence intervals, which capture the uncertainty in the estimates (the effect is statistically significant if the bars do not overlap with the dashed line). Note: Support for the proposed constitutional reform measured on a 0-10 scale. A value of 0 is equal to the control group. The graph plots OLS regression coefficients with 90% confidence intervals, controlling for age, gender, education, income, voting intentions for the main parties, and prior attitudes on the reform as measured in Wave 1 (N=1,526, R2=.680). 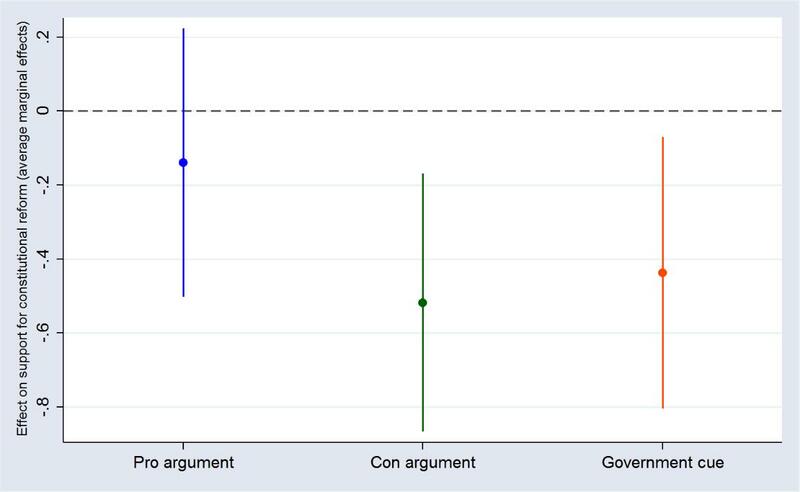 As Figure 1 illustrates, pro arguments failed to increase support for the reform, while exposure to one of the main arguments against the reform – the argument stating that the reform would lead to excessive concentration of power – significantly reduced support among the participants. However, support for the reform also declined when the participants did not read any arguments, but only a simple government cue, as the orange bar indicates. Our research also suggests a potential strategy available to the Yes side. Instead of tightly linking the referendum to the fate of the government, focusing on the content of the referendum might elicit higher levels of support. This perspective would be in line with our analysis on the data we collected from the first wave of our survey, in which we asked respondents how strongly they agreed on some measures that would be introduced by the reform. As Figure 2 illustrates, strong consensus exists on some parts of the reform. For example, around three quarters of voters agree on reducing the number of senators and even two thirds of No supporters agree on this point. Large support is also found for the strengthening of direct-democratic institutions, since the reform would introduce a mechanism for popular initiative bills, forcing the Chamber to discuss legislative proposals by citizens. Two thirds of respondents agree on this part of the reform, including around half of No voters. 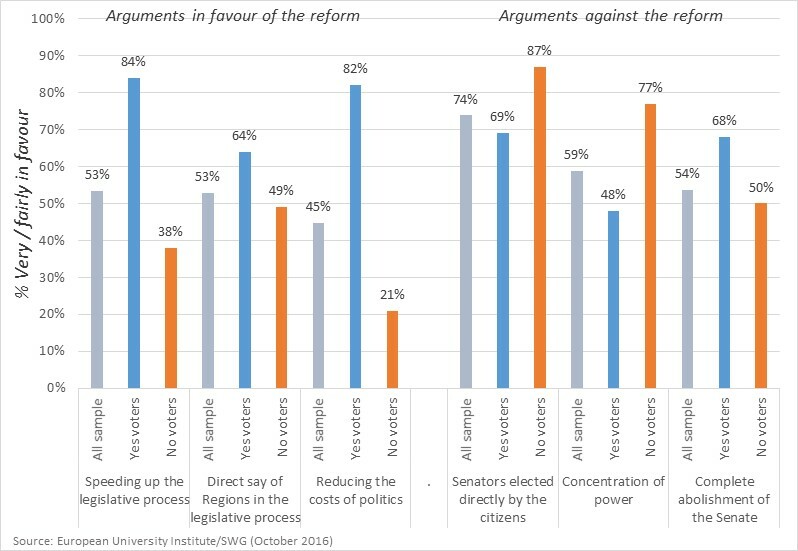 In contrast, the two elements related to concentration of power in the Chamber and at the State level clearly divide supporters and opponents of the reform. In the first wave we also asked respondents how strongly they agreed with six of the main arguments proposed from both sides of the campaign. In this case, clearer divisions occur between the Yes and No camps, but significant variation still exists. As figure 3 shows, the arguments against the reform receive a higher rating than supportive ones, in line with the fact that the sample includes a larger share of No voters (56%) than Yes voters (44%). With regard to pro arguments, we observe that voters particularly value the speeding up of the legislative process, and the fact that the reform would give more voice to the regions by appointing members of regional councils as senators. 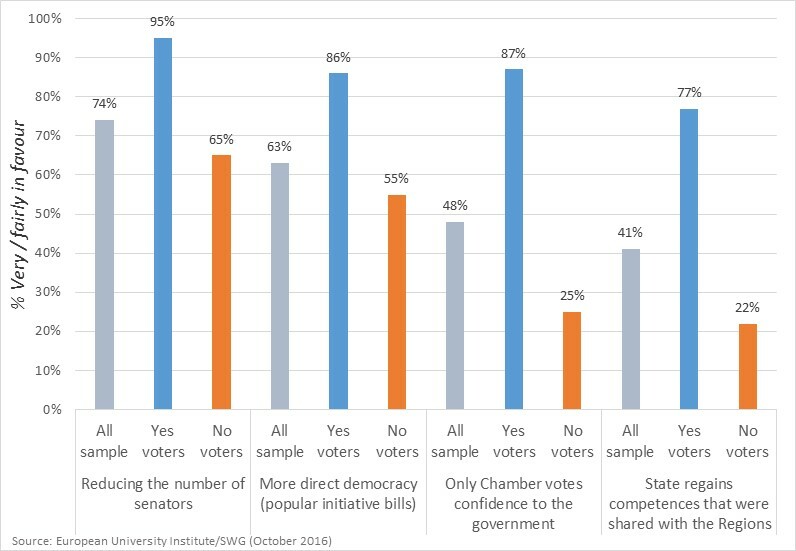 With regard to the arguments against the reform, a large share of voters agree with the fact that the members of the Senate should always be elected directly by citizens. Surprisingly, around two thirds of Yes voters also agree with this statement, although direct elections of senators will be abolished if the reform is approved. At the same time, Yes-supporters agree more than No-supporters on the fact that the Senate should be completely abolished, even if this argument is often voiced by right-wing opponents of the reform. This apparent inconsistency can be explained by the fact that for some of these voters an approval of the reform might represent the second-best option if the Senate cannot be abolished outright. In sum, our results highlight that Italian voters are not so much divided over the policy-content of the proposed constitutional reform, but are instead divided sharply along partisan lines and in particular between supporters and opponents of the Prime Minister. The strategy of associating a reform with the government’s fate might work when the particular government in question is popular. However, when approval ratings go down, this strategy can clearly backfire. As our study shows, by personalising the referendum, Matteo Renzi took a risky gamble that might ultimately deal a fatal blow to the Yes side’s chances of winning. A better strategy might have been to focus on the issues at stake in the hope of finding common ground – thus fostering a less sharply divided debate, in which agreement could have occurred on some parts of the reform. This entry was posted in -(meta) English, Experimental designs, Italian referendum. Bookmark the permalink.